Friday's Regionalliga Nordost match between Babelsberg and Energie Cottbus was halted twice because of fan trouble. 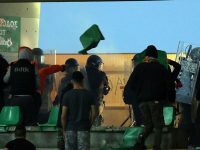 APOEL Nicosia fans clashed with riot police at Tsirion Stadium during their Cypriot Cup quarter-final match against AEL Limassol on Wednesday. Bayern Munich fans were attacked by Spanish riot police at the Santiago Bernabeu during their Champions League match against Real Madrid on Tuesday night. Brøndby fans clashed with riot police near the Brøndby Stadium after their 1-0 defeat to København. 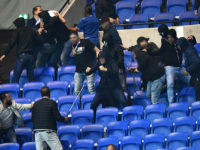 The start of Thursday's Europa League match between Lyon and Beşiktaş was delayed by fighting, pyrotechnics, and chaos caused by fans at the Parc OL. 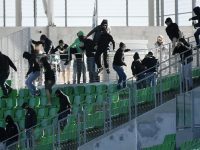 Slovan Bratislava fans clashed with stadium security and riot police in the stands during the club's away match against DAC Dunajská Streda on Saturday.